With its hilltop views of Long Island Sound, miles of beach and dunes, a wide harbor and a historic district of more than 50 houses, the hamlet of Mount Sinai might be expected to have been fully settled long ago. But while its population grew from 1,200 in 1960 to more than 8,000 today, large parcels are still being farmed and developed. The Renowned Mt Sinai School District has about 3000 children in a K-4 elementary school, a 5-8 middle-school and the high school, all of which are on one 65-acre parcel. 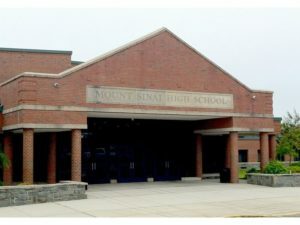 For almost 50 years Mount Sinai sent students to Port Jefferson High School. But in 1989 residents voted to build a high school, which cost $24 million and was completed in 1991. In 1993 it had its first graduating class, of 165 students. The district had state-of-the art equipment including computers linking classrooms with the State University of New York at Stony Brook. This lets high school students work one-on-one with graduate students at the university. Computer keyboarding starts in kindergarten. There are two condominium complexes. Woodridge Terrace, an adult community of attached town houses, has a clubhouse, swimming pool and mini-golf course. Mountain Ridge has 18 three-bedroom units whose large rooms and water views. The complex has a pool, clubhouse and tennis courts. Mount Sinai also has a 32-home private community, Crystal Brook Park, on 100 wooded acres owned by the 100-year-old Crystal Brook Park Association. Residents lease the land and buy the houses and need association approval to sell a home or make extensive changes, like felling trees. Residents are assessed by the association, which pays taxes to the town. In addition, they pay $1,500 to $2,000 a year for a caretaker, a community building and beach and road maintenance. Many of the homes in the historic district, an area designated by the town, date to the 19th century and some to the 18th. But many have been modified and none of its structures, including the 1807 Mount Sinai Congregational Church, is on the National Register of Historic Places. The Town of Brookhaven operates two beach areas and the harbor. 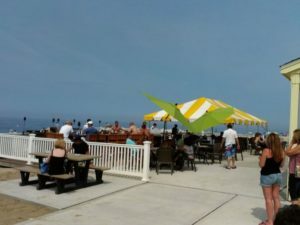 Cedar Beach, a one-mile stretch of land bisected by a nature preserve, has playgrounds, a boardwalk, a concession stand, basketball and fishing. A free Brookhaven Town parking sticker gives residents the use of the beach. Town residents pay $60 a year for one of 300 mooring sites in the harbor. The town also has 407 boat slips, which rent for $42 a foot for the May-to-October season. There is a two-year wait for slips. There are also two private boatyards and the Mount Sinai Yacht Club, with a total of 207 slips. Visitors like to stop at the Little Portion Friary on Old Post Road, where they can buy bread baked by the brothers. The 20-acre friary, which has been at the site since 1928, belongs to the Order of St. Francis, an Episcopal religious order with only about 200 brothers worldwide. Most shopping is on Route 25A, which has several small strip centers. The largest, a King Kullen center, has 32 stores. An annual event the chamber sponsors, now in its fourth year, is the Harbor Day Festival, an arts and crafts fair held in September at Cedar Beach. A full day festival, which includes jazz, whaleboat races and kite-flying contests. Mount Sinai came into existence as Old Mans (the name’s true origin is unknown) with the signing of two treaties with the Indians in 1664. Many of the early settlers were Davises or Philippses, and by 1800 the two families owned almost all the land from the southeast corner of Old Mans harbor to Middle Country Road. In 1842 or 1843, it is believed, the first postmaster, Charles Philipps, was asked to choose a new name and did so by holding a needle over an open Bible and dropping it onto a page. Although it was primarily a farming community, its young men were lured by seafaring and almost every family had at least one member who was a seaman. Because the harbor could not accommodate large boats, shipping and other businesses moved to Port Jefferson, just to the west. With few job opportunities and poor transportation — the Long Island Rail Road was extended to Port Jefferson in 1873 — Mount Sinai remained static for many years. In the early part of the 20th century some summer homes were built in Mount Sinai, but this small building boom died out by 1914. Slight booms after each World War did not bring about as much in the way of a population explosion as did development in the 1970’s, when suburban sprawl had inched its way past the L.I.R.R.’s terminus in Port Jefferson. Mount Sinai is a hamlet and census-designated place (CDP) located within the Town of Brookhaven in Suffolk County, New York, United States. 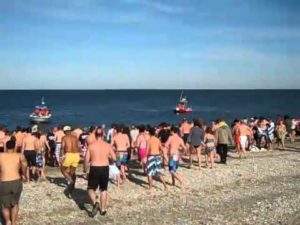 The population was 12,118 at the 2010 census.The hamlet is located on the North Shore of Long Island, and is served by the Mount Sinai School District and the Mount Sinai Fire Department, founded on October 25, 1930. The Mount Sinai Fire District covers approximately 5.5 square miles including the Mount Sinai Harbor and parts of the Long Island Sound. Mount Sinai’s ZIP code is 11766. The area now known as Mount Sinai was originally called Nonowatuck, or “stream that dries up”, by the Seatocot family of Native Americans who lived here. The first European settlers were Colonial settlers living in what is now Setauket, who obtained a deed from these local Native Americans in 1664. The origin of the town’s initial European name, “Old Mans”, is not known. The most prominent telling concerns Major John Gotherson, an elderly Englishman who was supposedly swindled into incorrectly believing he’d bought land in the New World by Captain John Scott, an important leader in Long Island’s early history. After Gotherson sent representatives who were quickly turned away, local residents started to jokingly refer to the land as “the Old Mans”. During the American Revolution, the area and Old Mans Harbor were under British control. However, because of its remote location the British did not have troops stationed here. Many citizens moved their families to Connecticut during British occupation. During the course of the war, American agents visited local patriots and received information, clothing, supplies and money to support the cause. In 1780, American Major Benjamin Tallmadge and a detachment of Continental Army dragoons landed at Cedar Beach and traveled south to successfully attack the British at Manor St. George.The route he and his men took is now marked as a historic trail. Once the Long Island Rail Road reached adjacent Port Jefferson in 1879, and temporarily continued into Mount Sinai from 1895-1939, new visitors and residents began appearing from New York City and from elsewhere on Long Island in order to enjoy the hamlet’s beaches and bucolic setting. The development of Mount Sinai for its natural and recreational qualities had begun with the 1841 establishment of a special care facility for sick and disabled children on the southwestern side of Mount Sinai Harbor. This consisted of housing and volunteer workers on a 130-acre (53 ha) plot, with the location being chosen due to its close proximity to St. Charles Hospital in adjacent Port Jefferson. On April 2, 1892, this parcel was sold to Dr. Jerome Walker, who established the Crystal Brook Park Association which is still owned and occupied today by Mount Sinai’s oldest private community known as Crystal Brook Park. In the first half of the 20th century the pace of building slowed. Although large tracts of farmland persisted, there were small pockets of development around the hamlet. Examples of these are the “colony” of homes built off Pipe Stave Hollow Road, both north and south of Route 25A, and the scattered development on Mt. Sinai and Chestnut avenues. During this time a community was mapped but never developed just south of Route 25A and east of Crystal Brook Hollow Road. It was not until the 1960s that housing developments began to occur as suburbanization spread eastward. Lands once farmed were now sold and developed into homes for new residents of Mount Sinai. This included the sale and development of the 404-acre Davis Peach Farm in the first years of the 2000s. Recently, many private communities have been built in Mount Sinai. These communities include Pulte Villages, Island Estates, The Hamlet at Willow Creek, and The Ranches at Mt. Sinai. This rapid growth has replaced much of the farmlands at an astounding rate for the past 5–10 years, and almost none is now left. The northern part of Mount Sinai Harbor borders an active recreation area that is located on a 2-mile long peninsula. This includes Cedar Beach, one of the most popular North Shore beaches during the summer months. 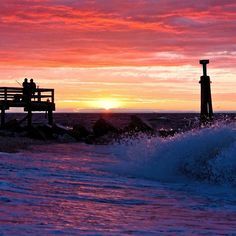 A marine sanctuary and nature preserve connects the various sections of Cedar Beach with scenic walking trails and serves to protect the remaining sand dunes. 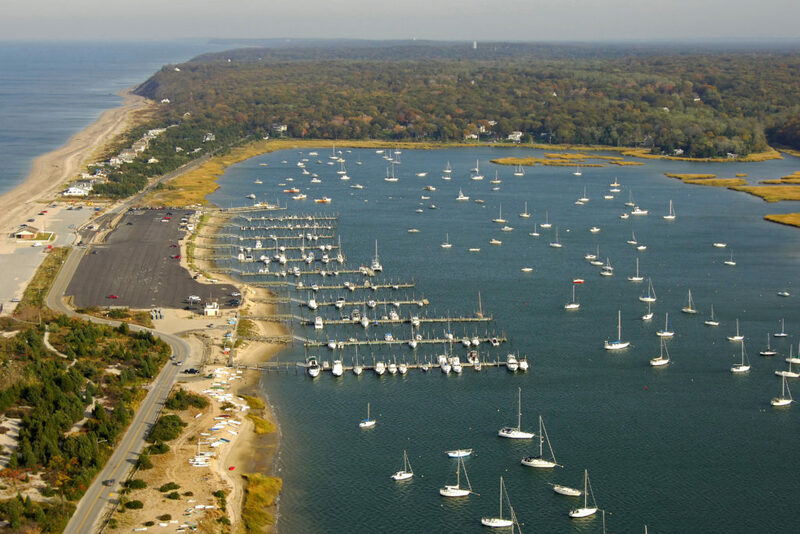 Commonly owned lands set aside in 1664 are being used for public recreation or have been rented for private use by a fishing station, yacht club and boatyard. A number of commercial fishermen work out of the harbor and fish in Long Island Sound. The peninsula, which is most directly accessible from the neighboring community of Miller Place, contains a number of historical vacation houses on both sides of the boundary line. The majority of these houses have since been converted to full-year use. The southern part of it is a more serene location. Clamming is a popular activity during low tide, as is fishing at high tide. Throughout its history, Mount Sinai Harbor has been utilized for the catching of shellfish, the fishing of snapper and flounder, the hunting of waterfowl, sand milling, and the harvesting of salt hay. Satterly Landing, a small park that once housed a boathouse, provides views across the harbor. The original mouth of the harbor was on the east side. Winds and tides continually narrowed its opening. Local residents toiled at widening the mouth. In the mid 19th century a new mouth was dredged on the west side of the harbor. Tides continue to dump sand, narrowing the mouth of the harbor. It still must be dredged to keep it open to allow for the boats moored in the harbor to reach the Sound. Three major civic battles were waged in the 20th century when various plans to dredge the harbor were proposed and pursued by the Town of Brookhaven. 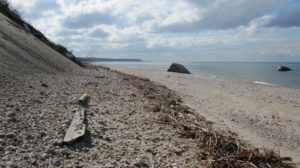 Two dredging projects were approved, and the present channels and deep basin south of Cedar Beach are the result of that action. A united civic action finally got the dredges out of the harbor in the late 1960s. As of the census of 2010, there were 12,118 residents, 4,080 households, and 3,391 families residing in Mount Sinai. The racial makeup of the CDP was 92.07% White, 1.5% Black or African American, 0.15% American Indian and Alaska Native, 4.0% Asian, 0.07% Native Hawaiian and Other Pacific Islander, and 1.3% from two or more races. Hispanic or Latino of any race were 5.8% of the population. The average household size was 2.96 and the average family size was 3.26. The median age was 41.9. As of the census of 2000, there were 8,892 residents, 2,671 households, and 2,283 families residing in the CDP. The population density was 1,657.7 per square mile (639.9/km2). There were 2,740 housing units at an average density of 520.1/sq mi (200.7/km2). The racial makeup of the CDP was 95.04% White, 1.24% African American, 0.08% Native American, 1.64% Asian, 0.03% Pacific Islander, 0.98% from other races, and 0.99% from two or more races. Hispanic or Latino of any race were 4.3% of the population. There were 2,671 households out of which 46.4% had children under the age of 18 living with them, 76.7% were married couples living together, 6.6% had a female householder with no husband present, and 14.5% were non-families. 11.8% of all households were made up of individuals and 7.0% had someone living alone who was 65 years of age or older. The average household size was 3.26 and the average family size was 3.54. In the CDP, the population was spread out with 30.0% under the age of 18, 7.2% from 18 to 24, 29.0% from 25 to 44, 24.8% from 45 to 64, and 9.0% who were 65 years of age or older. The median age was 36 years. For every 100 females, there were 95.4 males. For every 100 females age 18 and over, there were 96.0 males. The median income for a household in the CDP was $85,605, and the median income for a family was $89,636. Males had a median income of $62,093 versus $36,415 for females. The per capita income for the CDP was $31,131. About 1.8% of families and 3.6% of the population were below the poverty line, including 3.9% of those under age 18 and 2.1% of those age 65 or over.